How to define it in method? How to pass parameter to method in C# programming? 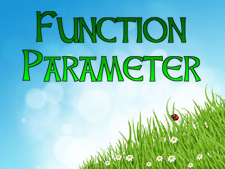 The parameter is the essential part of the function. However, it is optional but it makes the C# function more dynamic than simple function. There are two type of function parameter in C#, Value type parameter and reference type parameter, that is discussed in a lateral chapter in this section. C# parameter is nothing, just a way to passing value to the function and then function calculate the value and then returns appropriate results. You can understand C# function parameter clearly in the following example. You can also return appropriate value with return keyword. In this chapter you learned the basic of parameter in C#. You also learned a simple program of parameter. In next chapter you will learn Value type parameter in C#.